Caribbean Beach has so many wonderful food options. The Market Street Food Court has a great variety of items, and it’s an easy place to pick up snacks and drinks as you make your way out to the parks. With several food stations to choose from – Grab n Go, Broiler, Pizza/Pasta, Deli, Hamburger, and Bakery, there’s something for everyone. And when you return to the resort after a day at Magic Kingdom, Shutters in Old Port Royale is a wonderful place to enjoy a relaxed Caribbean-inspired dinner. 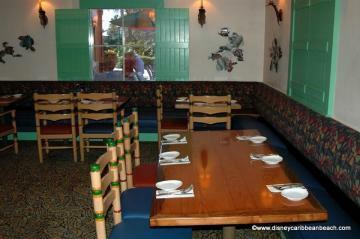 But what are the people’s favorite foods at Caribbean Beach’s restaurants? We polled our Facebook fan page, and we’re sharing our fan favorites with you. Lots of folks mentioned the sandwiches from the Deli station, and the Reuben, turkey BLT, and steak sandwiches are clear winners in that category! Also – many, many votes were cast for the pizza at the Pizza/Pasta station. Broiler favorites include rotisserie chicken and the pork platter. Hamburger station favorite: The bacon double cheeseburger with fries. (Isn’t everything better with bacon?) One commenter says that the “children's cheeseburgers taste better because they are served in a little sand pail with a shovel.” How cute is that? And bakery favorites include brownies and the Minnie's bakeshop peanut butter cookie. And for breakfast, the hands-down winner: Mickey waffles! In fact, one commenter went so far as to tell us that she likes, “anything shaped like Mickey!” Can’t argue with that one! Chocolate-chip pancakes, French toast, and the Western omelet were also mentioned as breakfast favorites. A few votes were cast for some favorite menu items from Shutters -- namely the prime rib, steak, and smoothies! Remember that menu items at Shutters can change from time to time, so be on the lookout for new dishes during your next visit! Finally, we want to give some love to the Banana Cabana pool bar. One commenter told us that she loves “our girls JoJo and Cathy at the pool bar - love them - the rum cocktails they make are the best.” Another told us, “I loved their pina coladas by the pool!” So after lunch, grab a lounger and head out to catch some rays and sip on your libation of choice! Do you have a favorite meal from Market Street or Shutters? Let us know in the comments section below, or join the conversation over on our facebook and twitter pages! This post is part of the DisMarks Disney Blog Carnival, which features dozens of great Disney-related articles from new and established bloggers.